There’s a new Deng biography out, which I’ll eventually get around to, even if I need to audiobook it while doing chores around the house. While Deng probably wouldn’t win a Greatest Chinese competition — surely Confucius would win that — he’d likely be a finalist. One can imagine that in time he’ll overshadow Mao, because his reforms have pulled six hundred million Chinese (and counting) out of abject poverty, while Mao’s policies caused tens of millions of deaths by famine. Incredibly, by the World Bank’s own admission, without Deng, there would be more people in extreme poverty today than there were thirty years ago!! Admittedly, we’ve added a couple billion people in that time-frame, so the percentages have improved — but it’s astonishing to think that in the past generation, a Communist despot is all that stands between World Bank policies and a worsening, worldwide poverty count. Apparently, the Danny Devito-sized dictator (Deng stood 5′ 0″) devised his policy after touring foreign countries, and deciding that Singapore’s authoritarian capitalism would make a great template to build from. He’d apparently visited Japan in his travels, for which he deserves some credit — who among us would be willing to learn from a former enemy that had occupied, pillaged and murdered its way through our country for the better part of fifteen years, and barely apologized for it? Six hundred million fewer extremely-impoverished Chinese people aside, there are two big stains on Deng’s record: the one-child policy and the 1989 crackdown on activists in Tiananmen Square, crackdown being the polite euphemism for “murder”. From a surface scan, it doesn’t look like he was notably worse than predecessors when it came to human rights or ethnic minorities (for whom the one-child policy did not apply) so in the historical sweep he seems unlikely to be penalized for that. In hindsight, the one-child policy seems to be an overreaction to the Mao famines of the early 1960’s — various studies suggest that it didn’t actually have much of an effect on birth rates, which had already been dropping. Of course, hindsight is 20/20, and many of us would probably be tempted to take extraordinary measures to reduce the risk of catastrophic famines, even if we’re collectively dragging our feet on pricing carbon properly. While the one-child policy has been implicated in the numbing levels of female infanticide in China, a closer look suggests cultural values may be the underlying culprit. In recent years, birth ratios of 115+ boys per 100 girls have been reported in China… but also in South Korea, which doesn’t have a one-child policy. (With ultrasound technology, it seems more parents are able to learn the gender of their baby early enough to legally abort female foetuses.) To the South Korean government’s credit, they took steps which brought the birth ratio back down to the south-east Asian baseline ratio of 107 boys per 100 girls. 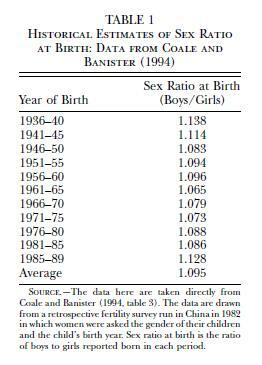 In Western countries the ratio is a bit lower, about 105 boys per 100 girls. A Harvard researcher attributed this to hepatitis B in a research report, the source of the table below: apparently, women with the virus are much more likely to give birth to boys than girls, suggesting that it may be more dangerous to female fetuses. His supporters say he didn’t issue the orders, but it’s impossible that he didn’t give his approval. The least damning thing that can be said for him in all of this is that he “only” ordered the death of thousands, which as bad as it was, was still a big improvement over Mao. There is a sunbeam of hope in all this: the fact that Deng’s supporters are trying to deflect the blame means that even in the Communist Party, there is a recognition that the response to Tiananmen Square was wrong-with-a-capital-W. This is a wonderful sign: they’re not even trying to defend the government’s response. Of such small mercies, moral progress is made. Even if the one-child policy had less influence on female infanticide than is feared, Deng’s decision/agreement to kill the pro-democracy movement in Tiananmen Square means he’s destined to be a world leader whose tremendous positive accomplishments will forever be accompanied by a bloody asterisk. As such, his nearest analogue in western history, is probably the Roman emperor Diocletian. Gaius Aurelius Valerius Diocletianus Augustus — whom historians mercifully, simply refer to as “Diocletian” — was the Roman Emperor equivalent of the mayor-elect of post-Godzilla Tokyo. In 284 AD, he took charge of a smouldering ruin, Rome having run through about twenty-five emperors in a half-century; to his eternal credit, over a twenty-year reign he patched Humpty Dumpty back together again. For this reason, he generally rounds out the lists of the top three Roman Emperors, after Augustus and Constantine. Recognizing that plagues and invasions had crippled the Roman economy, Diocletian set up a system to ensure a steady supply of tradespeople in each town: if your dad was a currier, skinner, tanner, or otherwise into leather, you would be, too. ;) Basically, the guy invented feudalism, which would ru(i)n Europe for a good millenium. For better and worse, he had a monumental impact on the course of history. Diocletian gets a bad rap from libertarians, taking the blame for currency debasement and runaway inflation, which many of his contemporaries complained about. But the thing is, the only reason those contemporaries complained about these things… was that they didn’t have to complain anymore about the even worse issues of barbarian invasions and endless civil war, which were what caused the currency debasement in the first place! In the face of an oncoming army, the general who fielded a large defensive force paid in funny money, was more likely to survive than one who fielded a small battalion paid in quality silver. Besides, in the old days, “if you can’t beat ’em, join ’em” rules applied: badly-outnumbered armies had a tendency to kill their generals and join the other side! So while Diocletian is blamed for economic mismanagement — among other things he imposed price controls, which were promptly ignored — it’s hard to make the charge stick. The economy was already a mess when the “ragin’ Dalmatian” came to power, with a smaller civilian population needing to support a larger army, and Rome having long since run out of rich nearby kingdoms to conquer. A modern example might be how in Lebanon, Hezbollah has grown to offer a complete, parallel set of civil services (social programs, schools, hospitals, media) as those provided by the national government. They’ve even crossed over in to pseudo-legitimacy, having elected representatives to the Lebanese Parliament. Of course, we should emphasize that the early Christian church was very, very different from this contemporary Islamic organization. About the least damning thing that can be said for Diocletian’s persecution was that most Roman bureaucrats ignored the orders; for one thing, Christians were more likely than their fellow citizens to actually pay their taxes in full. A modern analogue might be how, while Mormonism makes many Americans uncomfortable, Nevada’s casinos can’t hire enough of them: Mormon employees have a reputation for scrupulous honesty, a rather important trait given the rivers of cash flowing through Sin City! Deng and Diocletian are properly condemned for resorting to state violence against opponents, but since theirs were very different circumstances from the thankfully-largely-peaceful era of Canadian history, it’s hard to know how our leaders would have acted, in their shoes. Still, history gives us one incident where we can peer into Tommy Douglas’ core character: the October Crisis of 1970, when a handful of Quebec nationalists (the “FLQ”) kidnapped two diplomats, eventually killing one. Then-Prime Minister Trudeau rolled the army into the streets of Ottawa and tabled the War Measures Act, suspending civil liberties. Douglas’s holding to these moral stances mean that his public career is largely unblemished by contemporary ethical standards; if we were a culture that celebrated saints, he’d be one of the major ones. Of course, we live in a post-religious, secular world, so it remains to be seen how we’ll choose to keep him in our collective memory.